"Rack-mounted" redirects here. See also Industrial PC. A 19-inch rack is a standardized frame or enclosure for mounting multiple equipment modules. Each module has a front panel that is 19 inches (48.3 cm) wide. The 19-inch dimension includes the edges, or "ears", that protrude on each side which allow the module to be fastened to the rack frame with screws. By 1934, it was an established standard with holes tapped for 12-24 screws with alternating spacings of 1.25 inches (31.75 mm) and 0.5 inches (12.70 mm)  The EIA standard was revised again in 1992 to comply with the 1988 public law 100-418, setting the standard U as 15.9 mm (0.63 in) + 15.9 mm (0.63 in) + 12.7 mm (0.50 in), making each "U" officially 1.752 inches (44.50 mm). Typically, a piece of equipment being installed has a front panel height 1⁄32 inch (0.031 inches or 0.787 millimetres) less than the allotted number of Us. Thus, a 1U rackmount computer is not 1.75 inches (44.4 mm) tall but is 1.719 inches (43.7 mm) tall. 2U would be 3.469 inches (88.1 mm) instead of 3.5 inches (88.9 mm). This gap allows a bit of room above and below an installed piece of equipment so it may be removed without binding on the adjacent equipment. A key structural weakness of front-mounted support is the shear stress placed on the mounting rails and the leading edge of the equipment. As a result, 4-post racks have become common, with such racks featuring a mirrored pair of rear mounting posts. Since the spacing between the front and rear mounting posts may differ between rack vendors and/or the configuration of the rack (some racks may incorporate front and rear rails that may be moved forwards and backwards, i.e. APC SX-range racks), it's common for equipment that features 4-post mounting brackets, to have an adjustable rear bracket. Servers and deep pieces of equipment are often mounted using rails that are bolted to the front and rear posts (as above, it's common for such rails to have an adjustable depth), allowing the equipment to be supported by four posts, while also enabling it to be easily installed and removed. Although there is no standard for the depth of equipment, nor specifying the outer width and depth of the rack enclosure itself (incorporating the structure, doors and panels that contain the mounting rails), there is a tendency for 4-post racks to be 600 mm (23.62 in) or 800 mm (31.50 in) wide, and for them to be 600 mm (23.62 in), 800 mm (31.50 in) or 1,010 mm (39.76 in) deep. This of course varies by manufacturer, the design of the rack and its purpose, but through common constraining factors (such as raised floor tile dimensions), these dimensions have become quite common. The extra width and depth enables cabling to be routed with ease (also helping to maintain bend-radius for fibre and copper cables) and deeper equipment to be utilised. A common feature in IT racks are mounting positions for "Zero-U" accessories, such as PDU (power distribution units) and vertical cable managers/ducts, that utilise the space between the rear rails and the side of the rack enclosure. Racks are available with either four or two vertical posts. Four-post racks allow for mounting rails to support the equipment at the front and rear. These racks may be open in construction (similar to the traditional open-style two-post racks), or may be enclosed by front and/or rear doors, side panels, or tops. 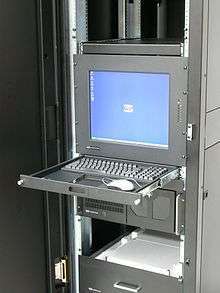 Two-post racks provide just two vertical posts; a piece of equipment can be mounted either via its front panel holes, or close to its center of gravity (to minimize load on its front panel), depending on the design of the rack. Two-post racks are most often used for telecommunication installations. There is no standard for airflow and cooling of rack mounted equipment. A variety of airflow patterns can be found, including front intakes and rear exhausts, as well as side intakes and exhausts. Low-wattage devices may not employ active cooling, but use only passive thermal radiation to dissipate heat. Large server rooms will often group rack cabinets together so that racks on both sides of an aisle are either front-facing or rear-facing, which simplifies cooling by supplying cool air to the front of the racks and collecting hot air from the rear of the racks. These aisles may themselves be enclosed into a tunnel so that cooling air does not travel to other parts of the building where it is not needed. Raised floor server rooms serve a similar purpose; they permit airflow to equipment through the underfloor space to the underside of enclosed rack cabinets. Racks are divided into regions, 1.75 inches (44.45 mm) in height, within which there are three complete hole pairs in a vertically symmetric pattern, the holes being centered 0.25 inches (6.35 mm), 0.875 inches (22.23 mm), and 1.5 inches (38.10 mm) from the top or bottom of the region. Such a region is commonly known as a U, for "unit", or in German "HE" (for Höheneinheit) and heights within racks are measured by this unit. Rack-mountable equipment is usually designed to occupy some integer number of U. For example, an oscilloscope might be 4U high, and rack-mountable computers are mostly between 1U and 4U high. A blade server enclosure might require 10U. 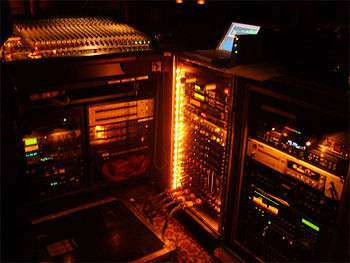 The height of a rack can vary from a few inches, such as in a broadcast console, to a floor mounted rack whose interior is 45 rack units (78.75 inches or 200 centimetres) high, with 42U being a common configuration. Many wall-mounted industrial equipment enclosures have 19-inch rack rails to support mounting of equipment. The 1948 original SSEM and the 1998 working replica (pictured) were mounted on 23 inch racking. 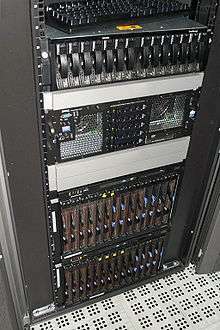 A 23-inch (580 mm) rack is used for housing telephone (primarily), computer, audio, and other equipment though is less common than the 19-inch rack. The size notes the width of the faceplate for the installed equipment. The rack unit is a measure of vertical spacing and is common to both the 19 and 23 inch racks. 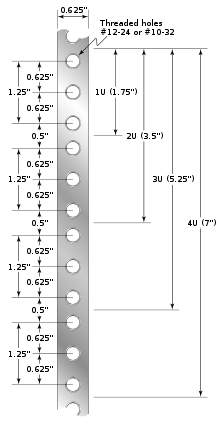 Hole spacing is either on 1-inch (25 mm) centers (Western Electric standard), or the same as for 19-inch (480 mm) racks (0.625 inches or 15.9 millimetres spacing). ↑ Max Lowenthal, The New Exchange of the Central New York Telephone and Telegraph Co. at Syracuse, N.Y., The Electrical Engineer, Vol XXVII, No. 561 (Feb 2, 1899); pages 142-147. The term relay rack appears on page 144 at the bottom of column 1. ↑ New Electric Interlocking at Allentown, PA, The Signal Engineer, Vol. 4, No. 9 (Sept. 1911); pages 344-345. ↑ Charles S. Demarest, Telephone Equipment for Long Cable Circuits, Bell System Technical Journal Vol.2, Issue 2, April 1923, page 139. ↑ G. Robt. Mezger (W2BLL), The Relay Rack in Amateur Construction, QST Vol. 18 (1934), American Radio Relay League. ↑ The Computer Rack section of The University of Iowa's DEC PDP-8, documents a relay rack made in 1965; Nov. 2011. ↑ "Define: Rack Hole Types". www.server-racks.com. ↑ "What is a Versa Rail". www.server-racks.com. ↑ "Telcordia GR-1502-CORE, Central Office/Network Environment Detail Engineering Generic Requirements". Archived from the original on 2009-07-29. Retrieved 2009-07-27. ↑ William B. George, Chassis Slide Mechanism, U.S. Patent 3,092,429, granted June 4, 1963. ↑ Scott F. Herbert, Electronic Assembly Chassis Supporting Track, U.S. Patent 2,809,085, granted Oct. 8, 1957. ↑ "Telcordia GR-3108-CORE, NEBSTM Requirements for Telecommunications Data Center Equipment and Spaces". Archived from the original on 2009-07-26. Retrieved 2009-07-24. 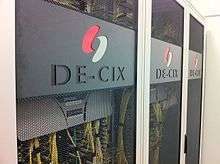 ↑ "The Server Rack FAQ - Define EIA-310". www.server-racks.com. ↑ A. C. Keller. "Recent Developments in Bell System Relays—Particularly Sealed Contact and Miniature Relays". The Bell System Technical Journal. 1964. ↑ "Open Rack 1.0 Specification Available Now". Open Compute.